As Mak Plus Power Systems Germany we also produce customized type DC UPS uninterruptible power supply solutions to solve possible problems. Because, need of uninterruptible power is important not only for industial areas but also for special areas. When you do not use the UPS, there can be really big damages and problems with your machines. After Customized UPS is designed in our factory in Germany, our experienced engineers applies long test process to the machines to get the best solution. M-DC UPS has two stage charging programmed fully automatic battery charging group. Devices in this group can be used for all batteries with the nominal voltage value 12V up to 220V from 5 Ampere up to 500 Ampere with several outputs which have been designed to be used with small and easy–use batteries with "plug and run" format. The distinctive features of this group are two stage charge, operator adjustment for parameters and they can also be used as power supplies. Easy maintenance and installation makes the job loss lowest. Projection of the Customized UPS is environmenntally and user friendly. We gives you long term usage guarantee for our Customized UPS USV products. 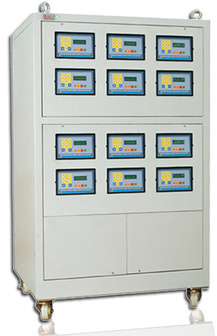 Our customized DC UPS’s are reliable and convenient to high power technology. There is a protection for short circuit and over load voltage. M-DC UPS has two stage charging programmed fully automatic battery charging group. Devices in this group can be used for all batteries with the nominal voltage value 12V up to 220V with several outputs which have been designed to be used with small and easy–use batteries with "plug and run" format. The distinctive features of this group are two stage charge , operator adjustment for parameters and can be used as power supply. M-DC rectifier customized is designed appropriate with customized conditions and high quality standards. M-DC UPS customized is the perfect protection for your machines. Thyristor control prevents the battery from being effected by fluctations on the network and an extreme regulation would be obtained as well as protection from operator faults. The device has a panel where the operator can follow and change the entire process. As Mak Plus Power Systems Germany family, we sell our customized UPS uninterruptible power supply solutions all over the World.